Background: Thyroid dysfunction is common in patients with type 2 diabetes mellitus (T2DM), and data on thyroid autoimmunity in T2DM are scarce. This study was designed to observe the frequency of thyroid dysfunction and autoimmune thyroid disease in Bangladeshi T2DM patients. Materials and Methods: In this cross-sectional study, we investigated 1056 T2DM patients with unknown thyroid function status throughout the country. Serum thyroid stimulating hormone (TSH) and free T4 (FT4) and antithyroid antibodies (antithyroid peroxidase or antimicrosomal) were measured. Statistical analysis was done using IBM SPSS Statistics for Windows, version 23.0 software. P ≤ 0.05 was considered statistically significant. Results: The observed frequency of thyroid dysfunction in our study was 21.9% (subclinical hypothyroid 14.1%, primary hypothyroid 4%, subclinical hyperthyroid 1.9%, overt hyperthyroid 1%, and secondary hypothyroid 0.9%). 32.9% of the participants were positive for thyroid autoantibodies. The patients with thyroid dysfunction had a higher body mass index (BMI), higher TSH, lower FT4, and higher thyroid autoantibody titer than euthyroid ones. Thyroid dysfunction was more common in females and autoantibody-positive individuals. TSH had an inverse negative correlation with FT4 in both euthyroid and thyroid dysfunction groups and had a positive correlation with age in the euthyroid group only. FT4 had an inverse correlation with age and duration of diabetes in both groups and with BMI in euthyroid diabetic patients. Conclusion: Thyroid dysfunction and autoimmunity are common in Bangladeshi T2DM patients. Thyroid dysfunction was more common in females and autoantibody-positive diabetic patients. Diabetes mellitus (DM) is a metabolic disorder affecting about 424.9 million adult people worldwide, and the majority of them have type 2 DM (T2DM). In Bangladesh, 6.9 million adult people had diabetes in 2017; it is apprehended that by 2045, this number will increase to 13.7 million. Thyroid dysfunction is the second most common endocrine disorder after diabetes with variable prevalence worldwide.,, A recent study found that 20.91% nonpregnant Indian adults have thyroid dysfunction. No data are available for the prevalence of thyroid dysfunction in Bangladesh. Thyroid disorders are the most frequent autoimmune disorders associated with type 1 DM (T1DM). Though thyroid dysfunctions are more common in T1DM than T2DM, numerous epidemiological studies worldwide indicate that the prevalence of thyroid dysfunction in T2DM is higher than that in the general population.,,, Several Indian studies also found hypothyroidism (either subclinical or overt) as the most frequent type of thyroid dysfunction in T2DM, and the prevalence ranged from 16% to 65.83%.,,,, In Bangladesh, Moslem et al. found that the frequency of thyroid dysfunction among T2DM was 10%, whereas Khan et al. and Alam et al. found a higher prevalence (23.5% and 30%, respectively).,, However, data on thyroid autoimmunity in T2DM are scarce. The present study aimed at determining the frequency and pattern of thyroid dysfunction and autoimmunity in Bangladeshi patients with T2DM with previously unknown thyroid function status. This multicenter, observational, cross-sectional study was carried out in the endocrinology outpatient departments of several tertiary hospitals of Bangladesh during July 2016–April 2018. The study protocol was approved by the Institutional Ethical Committee of Mymensingh Medical College, and the approval was taken from the corresponding hospital authorities before the commencement of the study. Nonpregnant adult T2DM patients with unknown thyroid status were included in the sample. Patients with previously diagnosed thyroid disease or getting medications that can affect thyroid function and those who were acutely ill, nonambulatory, or having mental incapacity were excluded from the study. After having informed written consent, the participants were interviewed and examined for relevant information; data were recorded in a preformed, semistructured data collection sheet. Diabetes diagnosed at or after the age of 25 years, not presented as diabetic ketoacidosis initially, and which was controlled initially or thereafter with oral antidiabetic drugs for at least 6 months was considered as T2DM. Obesity statuses were determined by body mass index (BMI) categories applicable for the Asian Indians. Serum thyroid-stimulating hormone (TSH) and free T4 (FT4) were measured in all patients and thyroid autoantibody (either antithyroid peroxidase [anti-TPO] or antimicrosomal antibody [TMAb], depending on the availability of the test at particular center) was measured in the majority of the patients. Either radioimmunoassay or chemiluminescent immunoassay was used for the measurement of TSH, FT4, and anti-TPO (or TMAb) depending on the availability of the test method at the particular center. Thyroid function status was interpreted according to the reference range of the corresponding laboratory and categorized according to the American Thyroid Association guideline., For the convenience of data analysis, FT4 levels were converted to ng/dL unit, if reported in other units, using appropriate conversion factors. Participants having an elevated titer of either anti-TPO or TMAb were considered as positive for thyroid autoimmunity. Statistical analysis was done using the Statistical Package for the Social Sciences (SPSS), version 23.0 Software (SPSS Inc; Chicago, IL, USA). The categorical variables were presented as percentages and measurable variables as mean±standard deviation (SD) or median. Student's t- test, Chi-square test, and Mann–Whitney U-tests were performed as applicable for comparing the variables between different groups. Pearson's correlation test was used to observe correlation among different variables (TSH, FT4, Hemoglobin A1c [HbA1c], age, duration of diabetes, BMI, etc.). P ≤ 0.05 was considered statistically significant. In this cross-sectional study, 1056 cases of T2DM throughout the country with unknown thyroid function status were included. Clinical and laboratory characteristics of the study participants with and without thyroid dysfunction are shown in [Table 1]. Patients with thyroid dysfunction had higher BMI, higher TSH, lower FT4, higher thyroid autoantibody titers, and higher frequency of thyroid autoimmunity than their euthyroid counterparts. The frequency distribution of thyroid function status in the study participants with male versus female comparison is shown in [Table 2]. The overall frequency of thyroid dysfunction was 21.9%, and subclinical hypothyroidism was the most common type of thyroid dysfunction. Females had a higher frequency of thyroid dysfunction than male participants although the frequency of autoimmune thyroid disease (AITD) was similar in both genders. [Table 3] compares the BMI, TSH, FT4, and the frequency of thyroid function and autoantibody status among different age groups. Serum FT4 level had a downward trend with increasing age. Comparison of frequency of thyroid function status among individuals with and without AITD is shown in [Table 4]. Individuals with AITD had a higher frequency of thyroid dysfunction than those without. 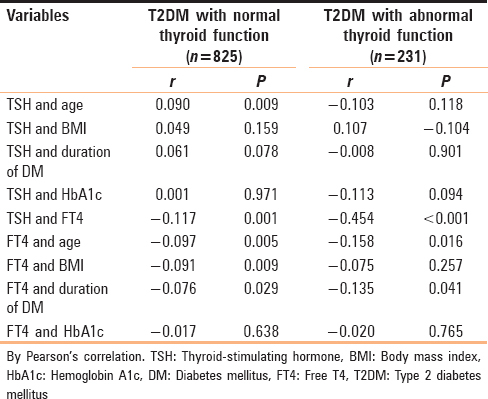 Correlations of TSH and FT4 with other variables in participants with normal and abnormal thyroid function are shown in [Table 5]. Serum TSH showed a positive correlation with age only in euthyroid T2DM patients. TSH had a negative correlation with FT4 in both groups. FT4 had an inverse correlation with age and duration of diabetes in both groups and with BMI in euthyroid diabetic patients. In the present study, 1056 patients with T2DM were evaluated for thyroid function, and 617 of them were evaluated for thyroid autoantibodies. Among the participants, 78.1% were euthyroid and the remaining 21.9% were found to have thyroid dysfunction. Subclinical hypothyroidism was the most common form (14.1%) of thyroid dysfunction, followed by primary hypothyroidism (4.0%), subclinical hyperthyroidism (1.9%), overt hyperthyroidism (1.0%), and secondary hypothyroidism (0.9%). About 32.9% of participants in this study were found to be positive for thyroid autoimmunity. Thyroid hormones are insulin antagonists; both insulin and thyroid hormones are involved in cellular metabolism and excess and deficit of anyone can result in functional derangement of the other. Serum TSH and tissue insulin sensitivity have important effects on serum lipid parameters in T2DM patients. At low-insulin sensitivity, relatively minor changes in TSH levels are associated with marked changes in lipid risk factors and thus cardiovascular risk. Subclinical hypothyroidism is an independent risk factor for the development of diabetic nephropathy. Unrecognized thyroid dysfunction may impair metabolic controls in patients with diabetes, and in addition, may amplify existing cardiovascular risk. Recognition and treatment of thyroid dysfunction in diabetic patients will benefit glycemic control, attenuate cardiovascular risk, and improve general well-being. A large proportion of patients (32.9%) in our study were found to be positive for antithyroid antibodies, and the frequency of AITD was greater in patients with thyroid dysfunction than euthyroid patients (59.3% vs. 23.5%, P < 0.001). The antithyroid antibody titers (anti-TPO or TMAb) were significantly higher in participants having thyroid dysfunction than euthyroid ones. Very few studies have evaluated thyroid autoimmunity in T2DM. The reported frequencies of thyroid autoimmunity in T2DM in the different population are 4% in Saudi Arabian, 3.79% in Libyan, and 12.2% in Ghanaian patients.,, Sarfo-Kantanka et al. also found that all categories of thyroid dysfunctions increased the risk of thyroid autoimmunity, which supports our observation. The observed frequency of thyroid autoimmunity in our study is higher than previous observations. Although in a recent multicenter study, 21.85% of the Indian adults were found to have AITD, no data are available for the frequency of AITD in general population of Bangladesh. Hence, our finding of AITD frequency in T2DM patients cannot be interpreted in the background prevalence of AITD in general population in this area. In our study, the mean HbA1c was similar in euthyroid and thyroid dysfunction groups (8.42% ±2.1% vs. 8.11% ±1.8%, mean ± SD, P = 0.052). On the contrary, Khorana et al. found a higher frequency of thyroid dysfunction in patients with uncontrolled diabetes than those whose diabetes was controlled. In our study, the frequency of thyroid dysfunction was higher in thyroid autoantibody-positive individuals than negative ones (47.3% vs. 15.9%, P ≤ 0.001) and the frequency of hypothyroidism (subclinical and overt) was also higher in the autoantibody-positive group. Ahmed et al. found that 23.3% T2DM patients with hypothyroidism were positive for thyroid autoantibodies. Serum TSH level had a positive correlation with age of the euthyroid T2DM patients and had no correlations with age, BMI, duration of diabetes, and HbA1c in both euthyroid and thyroid dysfunction groups. On the other hand, serum FT4 negatively correlated with TSH, age, and duration of diabetes in both groups and with BMI in the euthyroid group only. The major limitation of the study was the lack of unique assay method for TSH, FT4, and antithyroid antibodies as different centers used different methods of hormone assay although the reference ranges of the corresponding laboratory were used to define thyroid status. No healthy control group was taken which might have diluted the importance of comparisons and observations. The major strengths of the study are being multicenter and a large sample size from different parts of the country. High frequency of thyroid dysfunction and autoimmunity were observed in Bangladeshi T2DM patients; subclinical hypothyroidism was the most common form of thyroid dysfunction. Thyroid dysfunction was more common in T2DM patients who were female, had higher BMI, and had AITD. Further larger scale studies are needed on the cost-effectiveness of routine screening for thyroid function and autoantibodies in T2DM patients. International Diabetes Federation. IDF Diabetes Atlas. 8th ed. Brussels, Belgium: International Diabetes Federation; 2017. Hollowell JG, Staehling NW, Dana Flanders W, Hannon WH, Gunter EW, Spencer CA, et al. Serum TSH, T4, and thyroid antibodies in the United States population (1998 to 1994): National health and nutrition examination survey (NHANES III). J Clin Endocrinol Metab 2002;87:489-99. Canaris GJ, Manowitz NR, Mayor G, Ridgway EC. The Colorado thyroid disease prevalence study. Arch Intern Med 2000;160:526-34. Unnikrishnan AG, Kalra S, Sahay RK, Bantwal G, John M, Tewari N. Prevalence of hypothyroidism in adults: An epidemiological study in eight cities of India. Indian J Endocr Metab 2013;17:647-52. Radetti G, Paganini C, Gentili L, Bernasconi S, Betterle C, Borkenstein M, et al. Frequency of Hashimoto's thyroiditis in children with type 1 diabetes mellitus. Acta Diabetol 1995;32:121-4. Radaideh AR, Nusier MK, Amari FL, Bateiha AE, El-Khateeb MS, Naser AS, et al. Thyroid dysfunction in patients with type 2 diabetes mellitus in Jordan. Saudi Med J 2004;25:1046-50. Maxzud MC, Rasjido LG, Fregenal M, Calafiore FA, Lanus MC, D´Urso M, et al. Prevalence of thyroid dysfunction in patients with type 2 diabetes mellitus. MEDICINA (Buenos Aires) 2016;76:355-8. Khorana A, Dhoat P, Jain G. Prevalence of thyroid disorders in patients of type 2 diabetes mellitus. JIACM 2016;17:12-5. Kumar RA, Narasimhasetty KR, Lalitha R, Shetty SB. Prevalence of thyroid dysfunction among type 2 diabetes subjects in South India. Int J Clin Cases Invest 2013;5:93-100. Demitrost L, Ranabir S. Thyroid dysfunction in type 2 diabetes mellitus: A retrospective study. Indian J Endocrinol Metab 2012;16:S334-5. Singh G, Gupta V, Sharma AK, Gupta N. Frequency of thyroid dysfunction among diabetes in Punjabi population. Adv Biores 2011:2;3-9. Mukherjee S. Prevalence of thyroid dysfunction in young patients with type 2 diabetes mellitus in Eastern India, study of 120 cases from a tertiary care hospital. JAFES 2015;30:155-8. Moslem F, Bithi TS, Biswas A. Prevalence of thyroid dysfunction among type-2 diabetes patients in an urban diabetes hospital, Bangladesh. Open Sci J Clin Med 2015;3:98-102. Khan NZ, Muttalib MA, Sultana GS. Association of thyroid hormone levels among type 2 diabetic patients attending a tertiary care hospital. Bangladesh Med Res Counc Bull 2016;42:90-4. Alam MJ, Mukti MN, Hoque MM, Ali MI, Kamal MM, Mallik SC, et al. Cross sectional evaluation of thyroid hormone levels in non-diabetic and diabetic patients in Bangladeshi population. Asian J Biol Sci 2013;6:228-33. Ross DS, Burch HB, Cooper DS, Greenlee MC, Laurberg P, Maia AL, et al. 2016 American Thyroid Association Guidelines for diagnosis and management of hyperthyroidism and other causes of thyrotoxicosis. Thyroid 2016;26:1343-421. Jonklaas J, Bianco AC, Bauer AJ, Burman KD, Cappola AR, Celi FS, et al. Guidelines for the treatment of hypothyroidism: Prepared by the American thyroid association task force on thyroid hormone replacement. Thyroid 2014;24:1670-751. Chubb SA, Davis WA, Davis TM. Interactions among thyroid function, insulin sensitivity, and serum lipid concentrations: The Fremantle diabetes study. J Clin Endocrinol Metab 2005;90:5317-20. Chen HS, Wu TE, Jap TS, Lu RA, Wang ML, Chen RL, et al. Subclinical hypothyroidism is a risk factor for nephropathy and cardiovascular diseases in type 2 diabetic patients. Diabet Med 2007;24:1336-44. Kadiyala R, Peter R, Okosieme OE. Thyroid dysfunction in patients with diabetes: Clinical implications and screening strategies. Int J Clin Pract 2010;64:1130-9. Ahmed AA, Mohamed SB, Elmadi SA, Abdorabo AA, Ismail IM, Ismail AM. Assessment of thyroid dysfunctions in type 2 diabetes mellitus patients in Surman, Western-Libya. Int J Clin Exp Med Sci 2017;3:1-4. Palma CC, Pavesi M, Nogueira VG, Clemente EL, Vasconcellos Mde F, Pereira LC Júnior, et al. Prevalence of thyroid dysfunction in patients with diabetes mellitus. Diabetol Metab Syndr 2013;5:58. Sarfo-Kantanka O, Sarfo FS, Ansah EO, Yorke E, Akpalu J, Nkum BC, et al. Frequency and determinants of thyroid autoimmunity in Ghanaian type 2 diabetes patients: A case-control study. BMC Endocr Disord 2017;17:2.